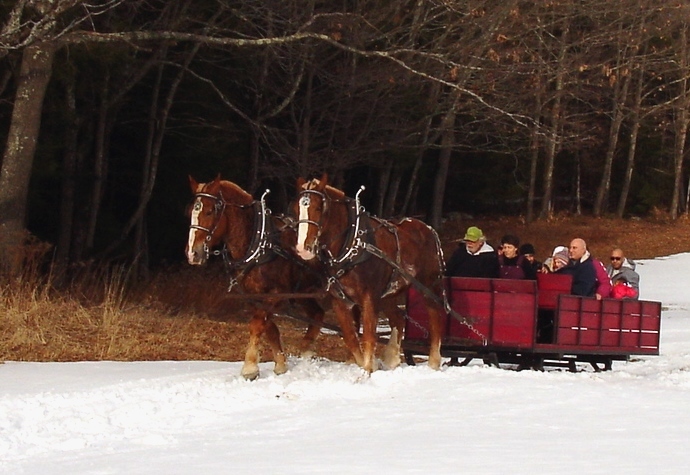 A horse-drawn sleigh owned by Stillbrook Acres delights passengers with a jaunt over the undulating, snow-covered terrain at Pineland Farms. 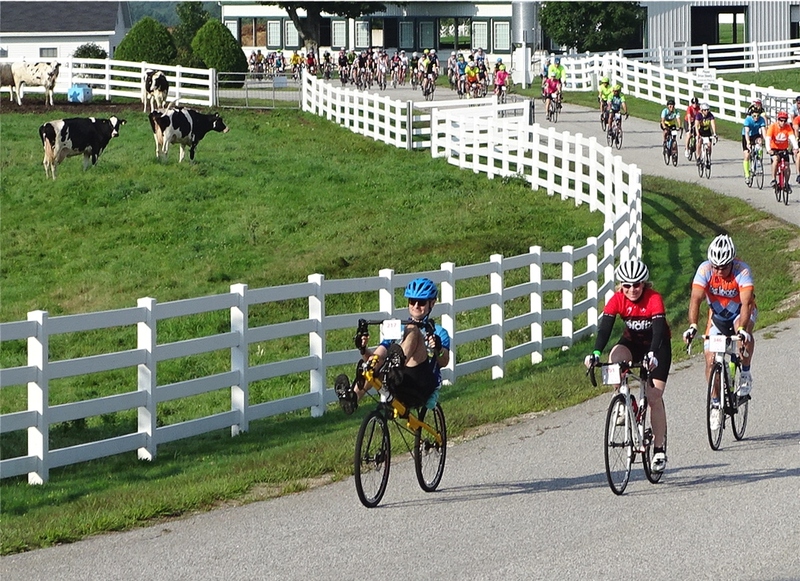 All rides are sold out this year for this popular event. Join RRCT members, neighbors, trustees, toddlers, grandparents and friends to hike the loop trail during the eighth annual Pisgah Hill Full Moon Trek from 5-8 p.m., Tuesday, Feb. 19. The highlight is a bonfire at the summit where hikers can sip hot cocoa, toast marshmallows and hoot or howl at the big orange rising moon. All the fun happens at Pisgah Hill Preserve, 74 Dougherty Road, near the Pownal town line. Plan to start your approximately 30-minute hike between 5 and 6:30 p.m. on a 1.5-mile lollipop-style loop trail. The path is well-marked and typically lighted with luminaries for the return. Gentle elevation rise and a rickety bridge on the trail require some effort; assistance for the elderly or toddlers may be required for one or two steep ledge steps. Bring snowshoes or sturdy boots with grippers, poles, a flashlight or headlamp, a blanket, water and lots of good cheer. Marshmallows and more are provided at this free event. The trailhead has a small parking lot which fills quickly. Most vehicles line the shoulder of Dougherty Road. Little Free Libraries are in 88 countries and number more than 79,000. These small libraries and can be found along many roads, in parks and at myriad other locations. The concept is for people of all ages to “take a book, share a book.” Courtesy dictates that if you take a book or two, return a book or two to either the location from which you borrowed or to another Little Free Library. Carla McAllister, assistant librarian at New Gloucester Public Library for nearly 10 years, has had a hankering for an LFL for a few years now. Tim Rice, her husband, made her dream come true by building a LFL that resembles the 1893 barn on the premises of their homestead. Dragonfly Farm Little Free Library is lit so that patrons can stop by after dark to check out what books are offered. 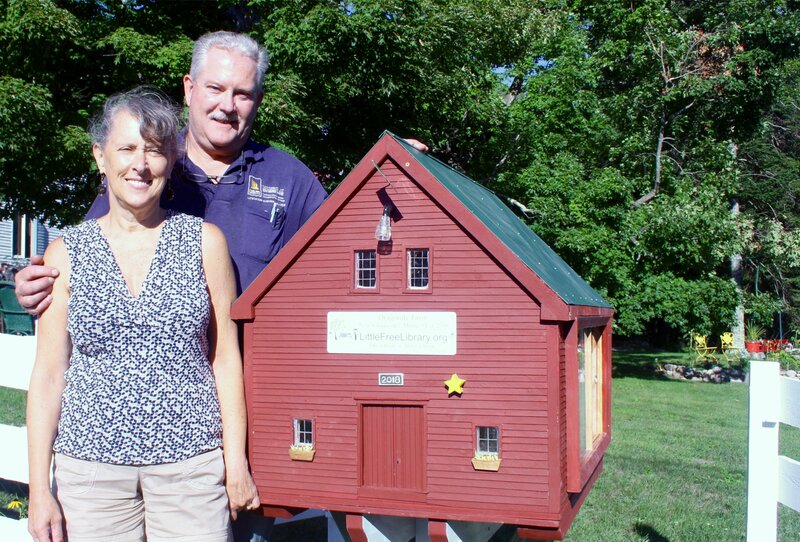 The couple believes this is the first LFL in the Gray-New Gloucester area to be found on the World Map posted at littlefreelibrary.org. People may search by town, zip code, steward name or registration number to find LFLs near where you live or where you might be visiting. Dragonfly Farm Little Free Library is located at 585 Shaker Road, one-half mile south of Shaker Village. You are invited to take away a book of interest and log comments about the overall concept or their LFL in particular. McAllister and Rice hope that their LFL will be respected, visited often, and fun for all. These volunteers are getting ready for a day of sprucing up the grounds at Sabbathday Lake Shaker Village during an annual Spring Work Day hosted by the Friends of the Shakers. 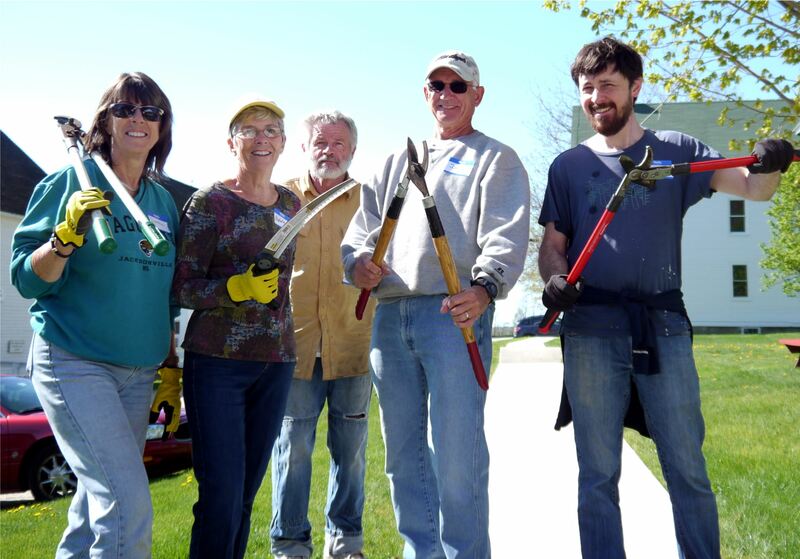 This year’s work day is scheduled for Saturday, May 12. Brother Arnold and Sister June invite you to put your hands to work and give your hearts to God because Spring Work Day is just around the corner. Join the Friends of the Shakers on Saturday, May 12 at Sabbathday Lake Shaker Village, 707 Shaker Road. Lend a hand working at various tasks suitable for all ages and abilities, including sweeping away the winter sand, cleaning out the hay barn, helping in the herb department, prepping the Shakers’ gardens, clearing brush, and so much more. Work days bring lots of hard work as well as much fellowship, too. Everyone shares the noon meal, conversation and laughter. Participants are asked to bring a potluck dish or dessert and drop it off at the registration check-in table located on the lawn at the back of the Brick Dwelling House. Chores start at 9 a.m. and last until 3 p.m. All necessary tools and supplies will be furnished but if you have a favorite pair of work gloves, feel free to wear them. Pre-register at www.friendsoftheshakers.org or by calling 926-4597. 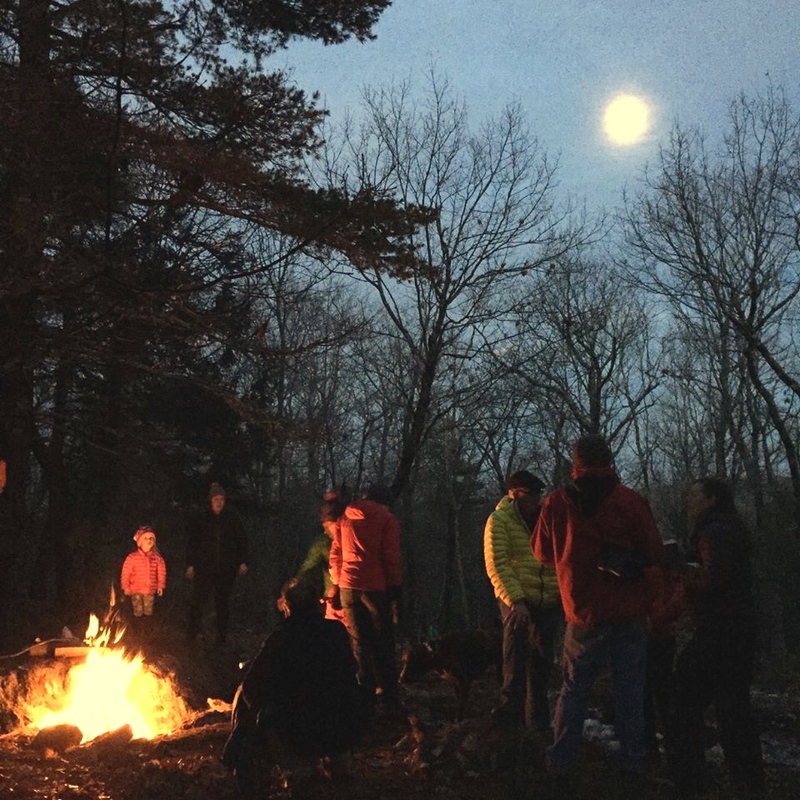 Nearly 100 enthusiasts hiked the loop trail to the summit of Pisgah Hill atthe Royal River Conservation Trust’s annual Full Moon Trek last February. This year’s trek is scheduled for Thursday, Feb. 1. Join Royal River Conservation Trust Thursday, Feb. 1, from 5-8 p.m. for a free self-guided hike and celebratory gathering atop 325-foot Pisgah Hill. This seventh annual event is free and accessible to those with snowshoeing experience. All the fun happens at Pisgah Hill Preserve, south trailhead, 74 Dougherty Road, near the Pownal town line. Last February nearly 100 RRCT members, neighbors, trustees, toddlers, grandparents and friends hiked the loop trail through a perfect amount of new snow, shared some cheer at the summit, toasted with hot cocoa, toasted marshmallows, and hooted at the big orange rising moon. The trail is well marked and typically lighted with luminaries for the return. Organizers recommend bringing snowshoes, poles, a flashlight or headlamp, blanket, water and lots of good cheer. The trailhead has a small parking lot which fills quickly. Most vehicles are asked to line the shoulder of Dougherty Road. For more details, call 632-6112. On Thursday, Jan. 4, the Royal River Conservation Trust will be sponsoring a Rain or Shine Club hike at its Pisgah Hill Preserve. Be mindful of the weather, and dress accordingly. Bring appropriate gear – for this outing, snowshoes, a thermos and a snack. The preserve’s trailhead, with a parking lot for four cars, is located at 97 Dougherty Road. Overflow parking is available along the shoulder of the road. The RRCT invites everyone to join in on their free Rain or Shine Club guided hikes, conducted every Thursday at 10 a.m., to explore the land trust’s preserves and trails. Check the schedule at www.rrct.org. Call or text Kyle at (207) 632-6112 for more information. NEW GLOUCESTER — Carl Wilcox has wanted to hike the Appalachian Trail for decades, and this year, the 54-year-old from New Gloucester checked it off his list. His 6½-month journey began in Georgia on March 7, and finished Sept. 21 at the top of Mount Katahdin. Wilcox took time away from his job as a wastewater engineer at Woodard & Curran to complete the trek, which wasn’t without its challenges. Wilcox spoke with the Lakes Region Weekly about his hike of more than 2,000 miles. Presented by the Royal River Conservation Trust, the Rain or Shine Club explores your backyard with a concise, thoughtful outing on Thursday of each week. Join the club for a free guided adventure that takes place under any weather conditions. The next two of them occur in New Gloucester. On Thursday, Feb. 2, 10 a.m., the club visits Chandler Mill Pond, 250 Chandler Mill Road, for the first time. If winter decides to prevail, the group can explore the shorelines from the ice; if spring persists, they can explore the pond from the shoreline. On Thursday, Feb. 9, 10 a.m., the site is Pisgah Hill Preserve – South at 74 Dougherty Road. Come help RRCT Stewardship Director Kyle Warren pack the trail, make luminaries, and build a snow bar at Full Moon Celebration Preparation for their sixth annual hilltop soirée. Call 632-6112 for more details. The mysteries of the Maine woods will be explored and revealed during this 2-hour guided hike through the Shakers’ land. Learn about the indigenous species of birds, mammals, reptiles, amphibians, fish, plants, trees, and fungi that occupy the many, diverse habitats of Shaker Village. See evidence of glacial and geological forces that formed the land and watershed, including Sabbathday Lake from Loon’s Point and the hidden treasure of Aurelia’s Cascade. The hike through hayfields, forest land, and century-old logging trails will include insights to the Shakers’ 200 years of land use and management. This program is designed for families, young and old, and promises a fun and memorable experience in the Maine woods. Dress for the weather and wear appropriate footwear for a 3-mile, moderate walk. Bug repellent and sunscreen recommended. Bring your camera, binoculars and bottled water. Trained naturalist and birdwatcher Carol Beyna will lead groups to the fascinating habitats of the Shaker Bog. The bog was originally built by the Shakers in 1816 as a reservoir to power their mills, but today, this 150-acre wetland has become a diverse ecosystem. The combination of woodland and wetland provides an ideal habitat for a wide variety of songbirds, game fowl, woodpeckers and more. Learn to beckon chickadees, nuthatches and other small birds. Possible sightings also include pileated woodpeckers, loons, ducks, Canada geese, and hawks. This program is designed for families, young and old, and promises a fun and memorable experience in the Maine woods from 8-10 a.m., Saturday, May 28, at Shaker Village, 707 Shaker Road, New Gloucester. Dress for the weather and wear appropriate footwear for a two-hour, moderate trail walk in the woods. Bug repellent and sunscreen are recommended, too. Bring your camera, binoculars and bottled water. The tour size is limited to 12. The class is free, but pre-registration is required. Register online at www.maineshakers.com, call 926-4597, or email info@maineshakers.com.